It’s August, and Kids Reading to Succeed closed out the summer with another great reading program at the Pasadena and Downtown Los Angeles locations! This month’s theme was “Authors”, a chance to think about books from a new perspective. Students at Villa Parke and the Union Rescue Mission spent the first hour of the program working with volunteers to improve their reading skills before schools begins at the end of the month. For the second hour, KRS students had an opportunity to understand how a book transforms from an idea on a notepad to a book on the shelf. At URM, new author Kristen Kittscher spoke to the students about her first book, “The Wig in the Window”. Kristen first talked about her own childhood and how her experiences growing up helped her develop ideas for a mystery novel. Kristen also talked about the process of developing a story outline and the time it takes to refine a repeatedly edited manuscript into a finished story. After a discussion of what makes a compelling story character, students developed outlines for their own stories and presented them to the group. Students at Villa Parke were visited by Jacqueline Abelson, author of “The Voice”, the story of a young girl who faces the prospect of a crucial surgery that will ultimately leave her deaf. Using journals donated by World Vision, Villa Parke students had the opportunity to develop their own characters and write an original story; those who finish their stories will be recognized at future KRS reading programs. Next month’s theme is “All About Money”. 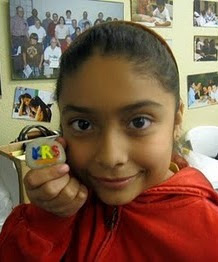 If you would like to volunteer at any KRS location, please click on the “Get Involved” tab.